“There are no strangers here, only friends who haven’t met yet.” Walking through the bustling theater district of Dublin‘s Temple Bar section, I stumbled across Al’s Stage Door Cafe. After stopping in, I found that this spot really lives up to its tagline. 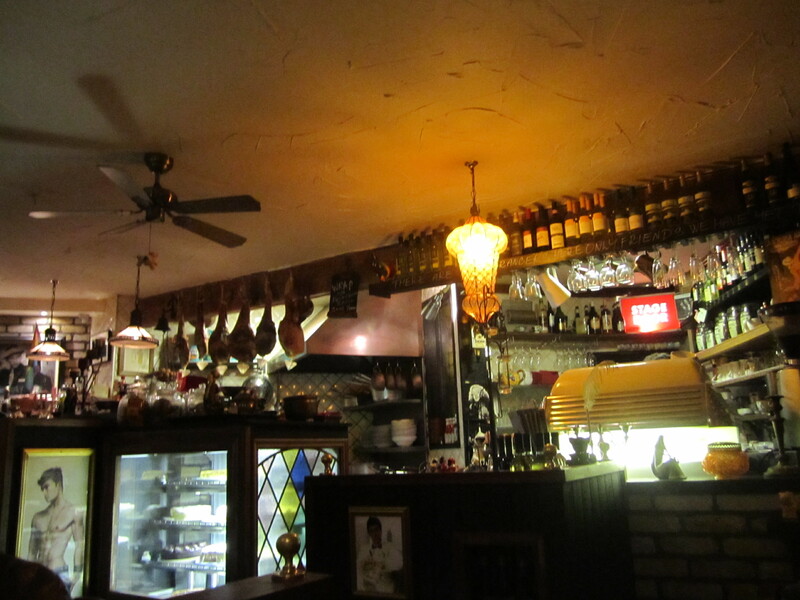 This delightful little place is the perfect place to warm up with a homemade stew or toasted sandwich and meet new friends. Read on to hear all about my awesome experience there — and find out what Al Pacino has to do with the whole thing! 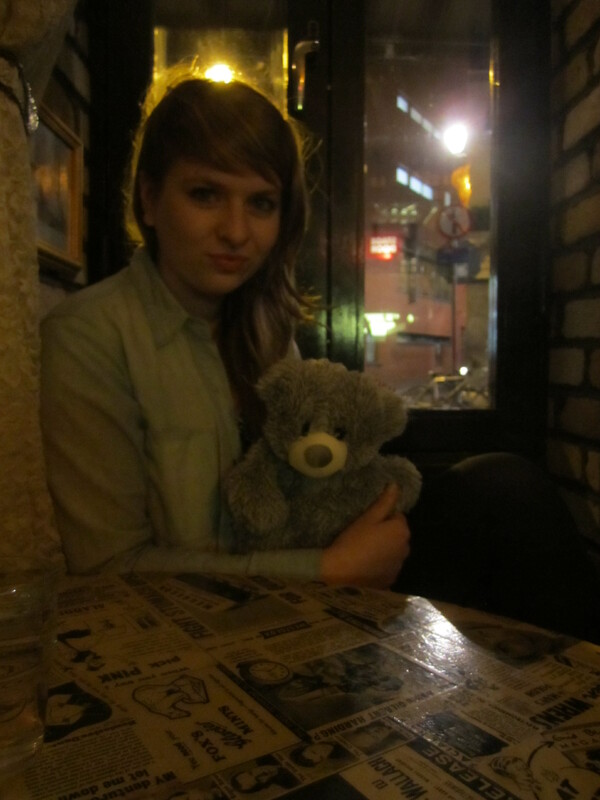 As soon as I sat down in the cafe, the staff came running over with a hot water bottle-filled teddy bear friend. Dublin’s weather in January (or any time, as I’ve been told) is no joke! After my experience with that teddy, I’m prone to ask for a similar friend at every restaurant I need to warm up in during the winter. The awesome newsprint tables and cozy window seat made for the kind of atmosphere that’s perfect for penning a novel or catching up with friends — old and new! 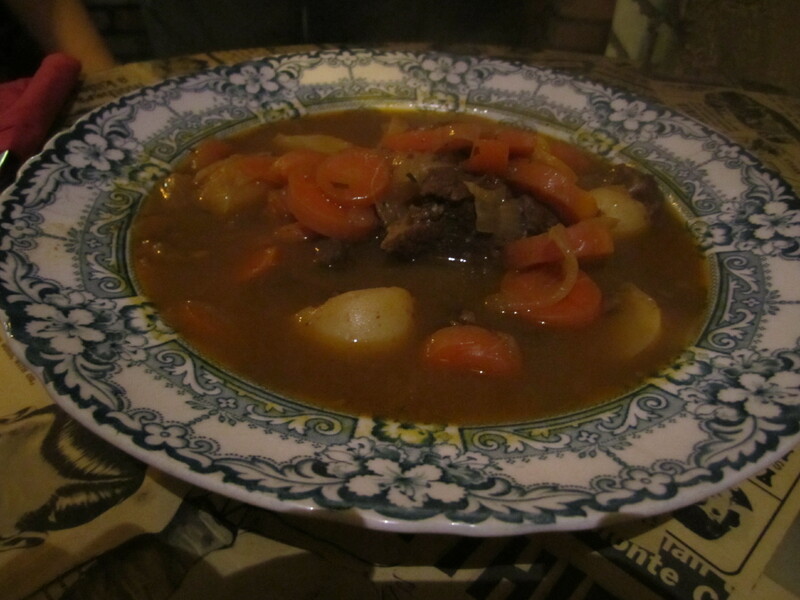 Okay, it’s time to see what we ordered: A hearty, homemade beef and potato stew really warms you up after a long day of traveling. 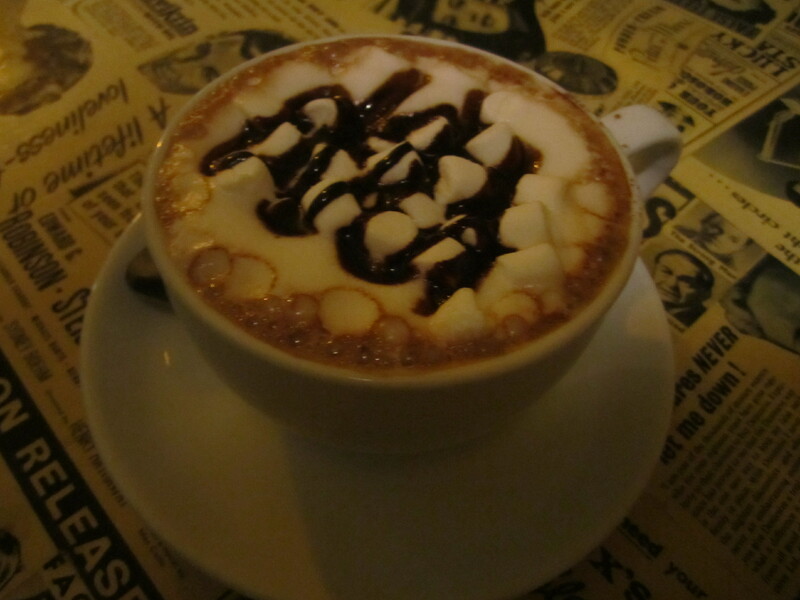 Or so the staff beckoned as they recommended my boyfriend get the day’s special. He took the chance to sample the Irish special — a tender, third-day beef and veggies mix. I do believe there was some actual bowl-licking at the end of the meal, which should be taken as compliments to the chef. 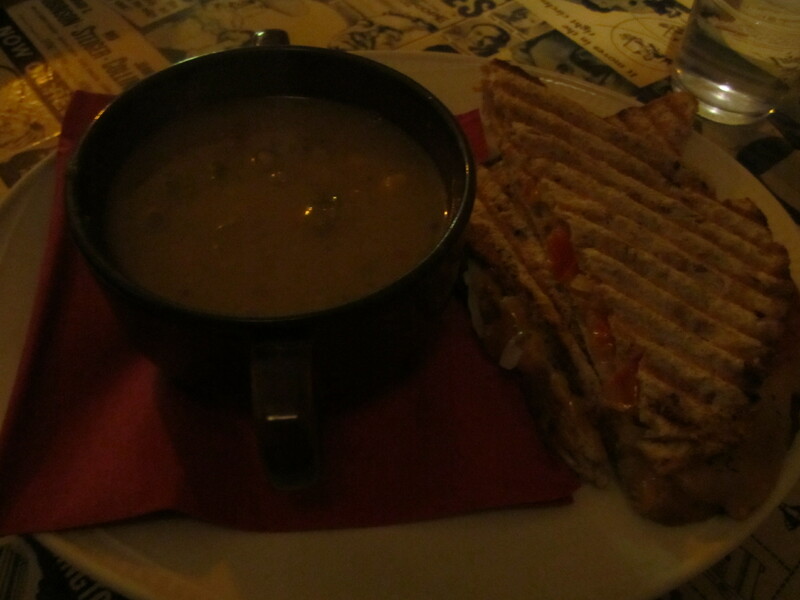 I mentioned that everyone was happy to make me a vegetarian version of the soup and sandwich combo. I always appreciate when restaurants can adapt their menus, but it was especially indicative of the homemade style of the whole cafe. My soup is a homemade vegetable stew (again, scraping the bowl to get every last drop!) and the sandwich is grilled Irish cheddar cheese, onions, tomatoes, and green peppers on toasted Irish brown bread. Anyone who knows me can attest to the fact that this combo doesn’t always work for me, but it just … worked. Dunking the crusts into my soup was a real experience, let me tell you. Alright, so I know I promised you some Al Pacino tidbits. Apparently whenever Pacino’s in Dublin, he stays at a hotel nearby. He stops in to this cafe, because even though the staff has at least five signed headshots of him displayed as kitschy decor, they leave him alone to have his coffee in peace! Unfortunately, we didn’t have any Pacino run-ins, but we did go back a second time during our stay … just in case! As an added bonus, you’ll get a lollipop (I’m sorry- a lolly) after you pay your bill. Because nobody’s too cool for plush hot water bottles and lollipops. If you go, Al’s is located at 11/12 Essex Street at Temple Bar, Dublin, Ireland. Trust me, the soup alone is enough to warrant a trip to Ireland. Don’t forget to try out a few hearty meals in Temple Bar’s pub-heavy neighborhood. And ask for a teddy bear friend! I am now sitting here craving a bowl of this soup, but alas, I won’t have it anytime soon, but I will one day to be sure.